Coverdale is a beautiful dale in the far east of the Yorkshire Dales and runs from the eastern end of Wensleydale to the dale head at a pass between Great Whernside and Buckden Pike. It is accessible by a single track road which runs the length of the dale and over the pass to Kettlewell in Wharfedale. The limestone dale with ancient woodland takes its name from the River Cover. 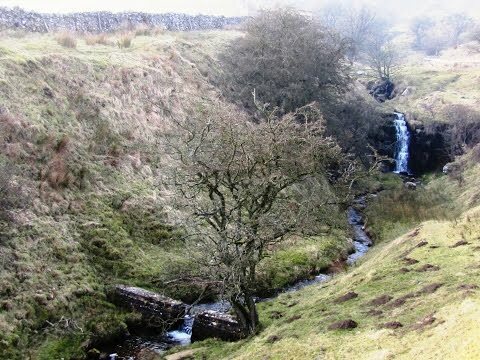 The river originates in the shake holes, between Great Whernside and Buckden Pike, which feed many small gills and it is where these conjoined flows meet at Hazel Bank Gill that the river becomes known as the River Cover. The river flows for 14 miles passing Woodale, Braidley and Horsehouse, through Gammersgill, then between West Scrafton and Carlton, and to the east of Agglethorpe before entering the River Ure south east of Middleham. Carlton, locally known as Carlton Town, is a delightful village in the Richmond district of North Yorkshire and within the Yorkshire Dales National Park. It is the largest village in Coverdale and sitting on the lower reaches of Penhill it provides fantastic views of the dale and the distant Roova Crags. Carlton once had two pubs, three shops, a petrol station, a cobbler, a blacksmith and two joiner’s workshops but now only the Foresters Arms and a garage remain also there is a village hall, a Methodist church and a wonderful waterfall. The 17th century Foresters Arms, which closed in early 2011, is now a community pub after the locals raised £300,000 in three weeks to buy it. The pub offers cosy open fires, oak beams, local cask ales, a good menu and en-suite accommodation. There are three ancient mounds near the village, two Bronze Age barrows, or burial mounds and one medieval Motte or castle dating from the 11th century. The motte is located at the back of the Foresters Arms. Swineside is a very small hamlet situated on the hillside on the edge of Swineside Moor at the end of a no through road one mile from West Scrafton. The hamlet consists of an old set of farm buildings and six houses. The farm buildings were formerly used as a Country Hotel and are still marked on the map as so. Today the farm is a private dwelling. Horsehouse is a lovely village about three miles from Carlton and named because of its importance as a staging post for drovers, travellers and their horses. Horsehouse was originally an important link between Wensleydale and the Cheshire salt mines and later the main coaching road from London to Middleham and Richmond. This once active and buzzing village had a church, two chapels, two pubs and a school but only the church of St. Botolph and one pub the Thwaite Arms remain. The valley narrows as it reaches Horsehouse and the village situated under Fleensop Moor looks towards the southern dominating hills of Little Whernside, Dead Man’s Hill and Great Haw. Gammersgill is another small hamlet situated the dale of Coverdale between Carlton and Horsehouse. West Scrafton a village to the south east of Carlton that we walked close too is situated below the Roova Crags on the banks of the River Cover. The village is home to about 30 houses ten of them are Grade II listed buildings and four others are listed artefacts being Bow Bridge, a line of bee-holes, the village telephone kiosk and a Bink for the storage of milk churns. The original 16th century pack horse bridge was covered with a more modern structure well before listing took place. The Partridge Inn one of the listed buildings which closed in 1925 featured as the Woolpack Inn in some episodes of All Creatures Great and Small and the Manor House dating from the reign of Henry VIII is said to be the birthplace of Lord Darnley husband of Queen Mary of Scots. Outside the Manor House is the Bink and the twelve Bee Holes are recesses in a nearby wall thought to accommodate bee hives. We turn right out of Carlton car park and walk down the road. We take the footpath on the right opposite the post box and head forwards down the walled lane (track). At the end of the track we turn right through the gate and head forwards to a wall corner and then follow the wall to the trees. At the trees we go through the gate and bear left with Goodman Gill on our right. We cross over two footbridges and head forwards uphill with a gill on the left. We go through a gate and bear right uphill and then go over a stile in the fence line and bear right again slightly downhill to go over a stile in the wall. We head forwards over the field to go through a gate and turn right to follow the road slightly downhill to a bridge. Here we turn left, sign posted Swineside, onto a track. Just before the farm entrance we turn left, at the sign post, uphill through some trees to go over a stile into a field. We head uphill bearing right to the corner of the field passing to the right of an old lime kiln and a telegraph pole. At the corner of the field where the stone wall is missing there is a gated stile between two posts and a sign post that has fallen over, just head across the corner of the next field to go over the stile into another field. Walk through the field then head slightly uphill to a wall corner and a sign post and follow the wall on the left. When we reach a wall in front of us we go through the gateway in the wall on the left we’ve been following. Cross the corner of the field to go over a stile then head uphill towards a building in the distance at Swineside. At Swineside we walk between the buildings and after going through a gate we turn right and follow a track along the back of the houses. At the end of the houses we go through a gate between two stiles and follow the path along the top of the hillside through the fields for just under just under half a mile then start to head downhill to Horsehouse we can see in the distance. When we reach Hindlethwaite Hall we walk downhill a little more and go through the gate. We make our way to the footbridge over the River Cover, cross over and bear left through the fields to Horsehouse. We turn left between the buildings and take a look at the church and the Thwaite Arms. After a break we retrace our steps back to the footbridge, do not cross, and turn left to follow the River Cover on our right. We follow close to the river, ignoring a path off to the left sign posted Gammersgill, until we come to the last stile here we head slightly left over two fields to the buildings of Gammersgill. We go through a gate into a paddock head forwards then go through the gate and turn right down the road. After a short way we turn right through the gap in the wall sign posted Carlton 1 ½ ml and make our way to another gap in the wall. We follow the little lane (track) to the end cross over a footbridge and bearing slightly right we head forwards through the field cross over a stile and go through a gate. We head forwards to a post we can see ahead of us and then cross a small footbridge. Head forwards over a stile then at the next stile turn left onto the road. At the bend in the road turn right at the sign post through the gate. We head forwards over a stile bear left uphill to the left of the telegraph pole to go through a fence and almost immediately over the stile in the wall and keep heading uphill to the road. We turn right and follow the road back into Carlton but before we return to the car park we turn left at the telephone kiosk and follow the track to the right of the church to take a look at the waterfall. We head back to the village turn left and take a look at the Motte at the back of the Foresters Arms. This is an easy to moderate walk through fields, on tracks, lowland paths by the River Cover and some small road. There are some steep short inclines and declines. Approx 7 miles allow 2 hours 45 minutes using OS Explorer map OL30 Yorkshire Dales, Northern and Central areas. Wensleydale, Swaledale. Start point: Carlton car park. Carlton in Coverdale in the Yorkshire Dales. From A1 take the A684 to Bedale. At the t-junction in Bedale turn right for Layburn. At the small roundabout at Layburn turn left. At the far side of Wensley cross the bridge over the River Ure and take the next left. Follow this small road and the signs for Melmerby and Carlton. The car park is in Carlton village on the left and there is a £1 honesty box. There are no public toilets. For refreshments there is a community pub the Foresters Arms at Carlton and the Thwaite Arms at Horsehouse. The nearest public toilets, a variety of shops and four pubs are in Layburn about 6 miles from Carlton.